The GLCM team capped its trip to Denver with two incredible site visits in Aurora. Our morning visit was hosted by Kiewit Corporation and University of Illinois alumnus, Courtney O’Connor. Courtney has been with Kiewit for two years and is the civil engineer on the I-225 Rail Project we visited. She was joined by Gabi Johnson, Public Information, and Pete Remington, Deputy Project Manager. Kiewit is an employee-owned, global corporation that experiences an annual revenue of over $12 billion and owns the largest Caterpillar equipment fleet of any contractor in the United States. 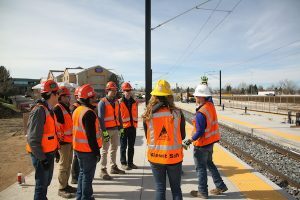 In Aurora, Kiewit is contracted by the Regional Transportation District to design and build 10.5 miles of light and commuter rail, along Interstate 225, through Aurora. 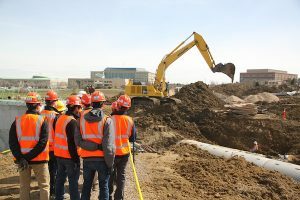 Kiewit is moving at a rapid pace to excavate massive quantities of soil, relocate utilities, build 8 stations, 11 substations, bridges, and rail. The entire project is slated to cost $400 million and open in late 2016. As of our visit, design was 99% complete, construction was 55% complete, and 27% of the work was subcontracted out to small business enterprises. We were offered the unique opportunity to get an up-close and personal look at the project thanks to Kiewit, and were able to see the progression of the project from the beginning of the project, where it will need to tie into existing rail, to the end where it will need to connect to new rail leading to Denver International Airport. We started at Iliff Station, where rail, platform, and substations were built and systems work was being completed. Next, the GLCM team moved north to Sable where we observed massive excavation as Kiewit was finding and relocating utilities. Kiewit was also trenching 108 inch diameter, 24,000 pound, storm pipes. Here we began to understand the level of coordination and scope of this huge project. We watched an operator use an 180,000 pound excavator, which cost $350 an hour to operate, to fill the trench with aggregate and backfill. After being thoroughly awed by the skill of the operator, GLCM moved to 13th Station, where Kiewit was preparing and leveling the land to have track and a station built. Workers need to move quickly in this area to stay in front of the team laying down rail a few miles south of them. Finally, we observed the end of the project at Peoria. 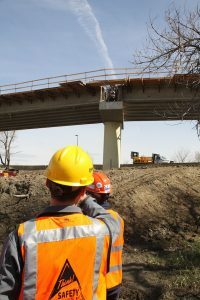 Here the Kiewit team was building an 1,100 foot bridge over a highway and looking to acquire land with storage units currently built on it in order to complete the project. Kiewit shut down the local highway to construct the bridge to the tune of $5,000 per night, and needed to coordinate all closures with the local hospital so as not to interrupt ambulance routes. Kiewit also prides itself on its work within the community. We were lucky enough to receive a presentation on their Big Thompson project by civil engineer, Ethan Hoppe. This was a project done to repair Highway 34 after it received substantial flood damage and declared to be a natural disaster. The project consisted of crews working 24 hours a day for 59 days to transport 650 truckloads of debris, pour 2,700 truckloads of concrete, and pave 22,000 tons of asphalt along 18 miles between Estes Park and Loveland. The workers finished 10 days ahead of schedule, and pulled workers and resources from projects all of over Colorado and the rest of the United States to rebuild the highway and the community. Locals were able to begin rebuilding their lives and dubbed the workers “Hard Hat Angels” for all their hard work. At the end of the visit, we quickly rushed off to grab some much needed nourishment before heading to our final stop of our trip: the famous Veteran’s Affairs Hospital joint venture between Kiewit and Turner Construction. We had heard so much about this project all week from locals and news outlets, and it certainly lived up to the hype.